Anyway, we’ve ascertained I love my browsers and one problem with this has always been trying to have the additional functionality provided by plug-ins and add-ons available in as many of these browsers as possible. That’s not always easy given extensions to browsers tend to be specific to each individual browser. It’s certainly not as simple as securing a plugin and installing in any browser you may have installed. 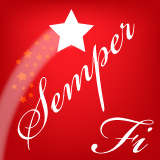 The major browsers provide stores for sourcing extensions and the official line from the providers of these extensions is that unless they provide a dedicated version for your specific browser you’re out of luck. Which was where I was at when I was in Opera, the browser I have dedicated to using Zenkit, and had the need to capture a page into DEVONthink Pro Office. DEVONtechnologies provide dedicated extensions for doing this for Google Chrome, Firefox and Safari but nothing for Opera. Obviously one option was to switch to one of the supported browsers then return to Opera but since I absolutely love Zenkit and repeatedly have the need to capture content opened from links stored there I decided some research was required. My first stop was DEVONthink HQ, sadly still no dedicated extension for Opera but I did find a useful post titled Use Clip to DEVONthink with Opera. This post outlined a different, even more useful, approach than if DEVONtechnologies had created their own dedicated extension for Opera. 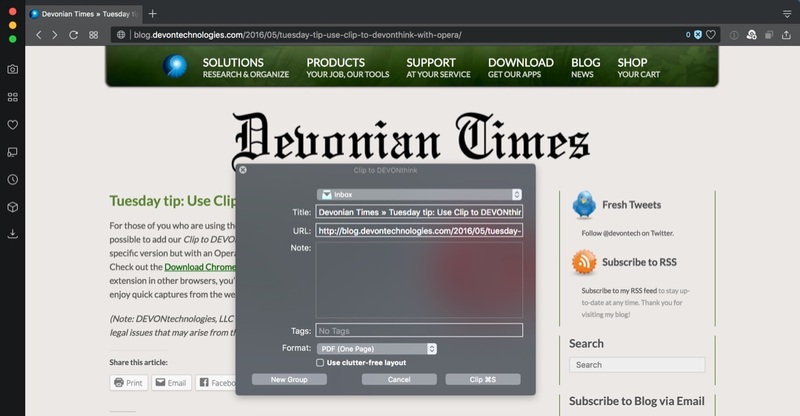 The good folks at DEVONtechnologies pointed readers to an extension for Opera that endowed Opera with the ability to download, install and use extensions built for Google Chrome directly from the Chrome Web Store. I think DEVONtechnologies are about to rock my world! 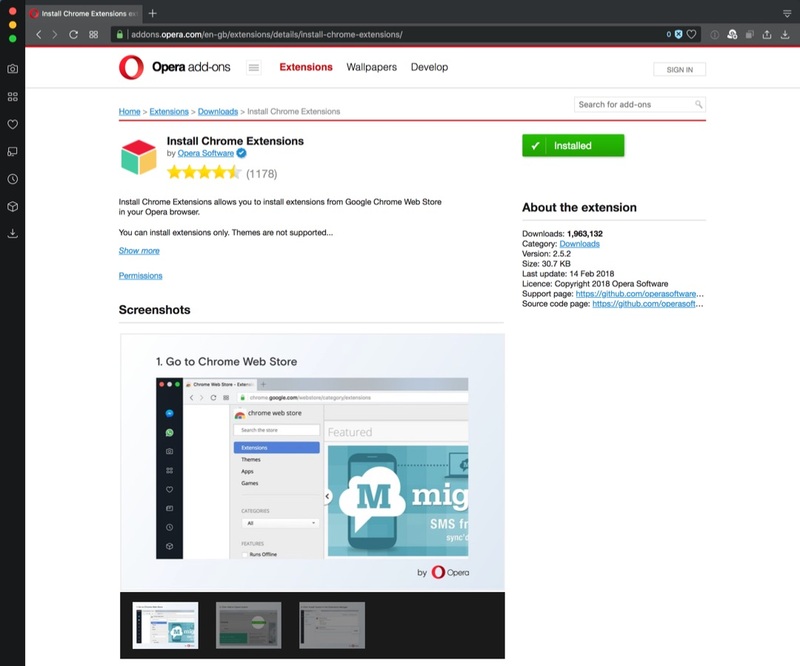 I hared off and installed this enabling Opera extension, “Install Chrome Extensions” and then headed off to the Chrome Web Store to download the Clip to DEVONthink extension designed for Chrome. On searching for DEVONthink I was greeted with a single search result and a large green button proclaiming clicking it would install the extension into Opera … which it did. One more click inside Opera to confirm I wanted to enable the extension and I was done. 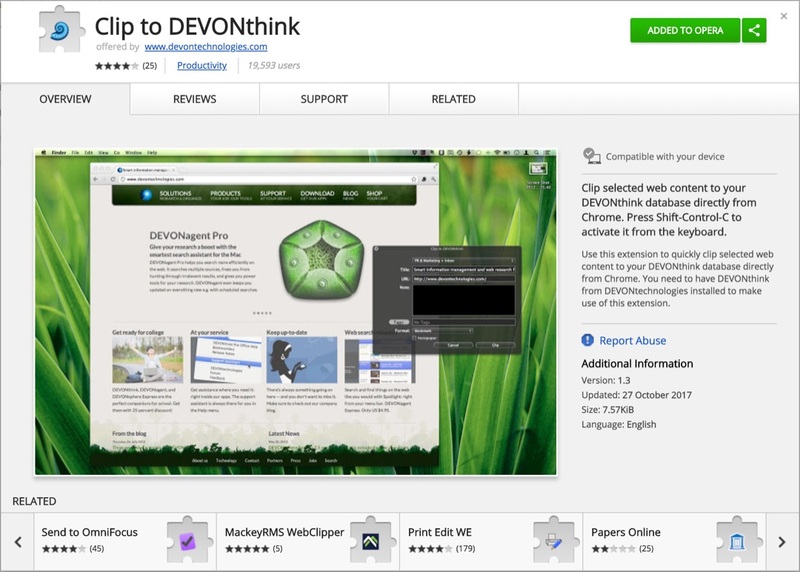 The DEVONthink Clipper icon appeared in the Opera toolbar and I’m happy to confirm it works as seamlessly as it does in Google Chrome. A single click on that toolbar button and the Clip to DEVONthink dialog box is displayed allowing me to add metadata to my capture in the form of Title, URL, Note, and Tags together with the ability to specify the format of the capture. 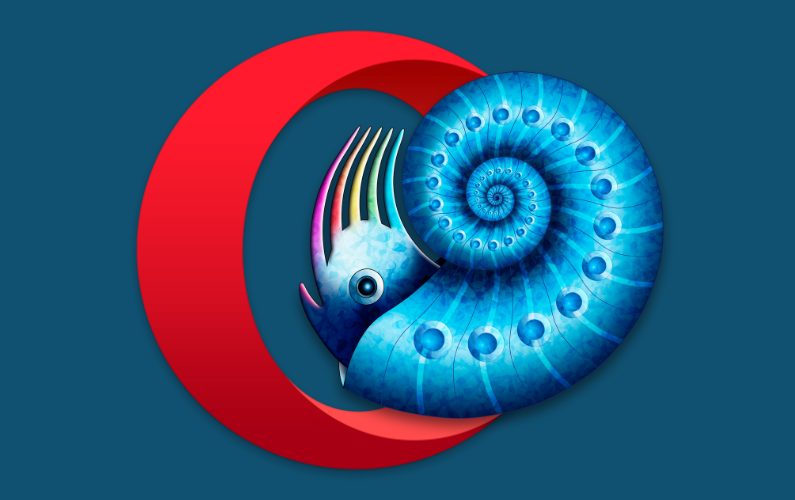 While I started out on this journey with the aim of being able to capture content to DEVONthink the availability of the “Install Chrome Extensions” extension has opened up a whole range of possibilities to bring parity between Google Chrome and Opera.